Now that you know how to choose a domain name, it’s time to register the desired domain name for your site. At present, the gTLDs (generic top-level domains) management is made by a nonprofit organization called ICANN (Internet Corporation for Assigned Names and Numbers). The companies who manage the reservation of internet domain names are called domain name registrars. The generic top-level domains are paid on an annual basis. This means that after the first year, you will have to pay a renewal fee, which is usually same as the initial fee, or slightly higher than what you’ve paid to register the domain name initially (depending on the domain registrar, the initial discounts, etc.). If you want, you can also pay upfront for multiple years. As long as you do not forget to renew your domain name, a domain name will be yours and nobody can take it from you. If you do not renew a domain name, that domain name will expire after some time from the expiration data and someone else will be able to register that domain name again. There are many companies where you can register a domain name. However, before selecting a company, you have to make sure that they are legit and reliable and that they are going to register your domain name with your details and not their own company’s information. You don’t want to register a domain name and after a year the company who has registered the domain name to ask you for a huge sum of money to renew your domain name, don’t you? I’ve heard stories like that before, and that’s the reason why I always register my domain names only from a trusted domain name registrar. There are two domain registrars that I recommend, and I’ve used these two companies to register all my domain names over the past few years. I think I have registered close to 30 domain names over the last years and even though I haven’t made anything with the majority of them due to my lack of focus on in a field, I have learned a few things about the domain names. My number one choice for registering a domain name is NameCheap. I’ve been one of their customers since for few years and all I can say it’s that I’m a super happy customer. I haven’t tested their web hosting services yet, but as a domain registrar, NameCheap receives a ten from me. GoDaddy is my second choice when it comes to choosing a domain name registrar. I’ve used GoDaddy before NameCheap, but lately, I have only used NameCheap. The main reason for choosing NameCheap over GoDaddy it’s because GoDaddy has slightly higher domain renewal prices than NameCheap. The advantages of GoDaddy over NameCheap is that GoDaddy very often has crazy discount coupons (in fact, that’s the main reason why I started using GoDaddy in the first place). For example, I was able to use these coupon codes to register a few “.com” domain names with $0.01, $0.99, or only a few dollars. The downside of that is that GoDaddy’s domain renewal price is with a few dollars more than NameCheap’s. Either way, since you only have to pay once a year for your domain name, even $20 is an insignificant amount of money to pay for something that’s so vital for your business. Both NameCheap and GoDaddy are well-known and trusted companies which have hundreds of thousands of customers. Next, I will take you through all the steps of registering a domain name, with screenshots of every stage. I will use NameCheap as the domain name registrar for this tutorial, but the process is very similar for GoDaddy, or for other domain registrars. In the input box that is displayed on the homepage, enter the desired domain name (including the domain extension). If your chosen domain name is available, you should see the registration price and a shopping cart icon on the right side of the domain name like in the screenshot below. 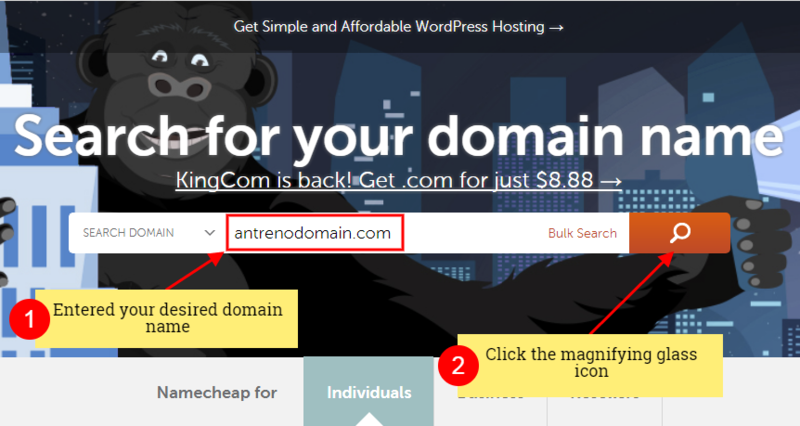 NameCheap is also going to give you other suggestions for your domain name, with different extensions. You can ignore that. A section called “Your Cart” will appear on the upper-right side of the page. This section will calculate the domain name price + the eventual ICANN fees. The “SubTotal” is the final price you have to pay to register the domain name. 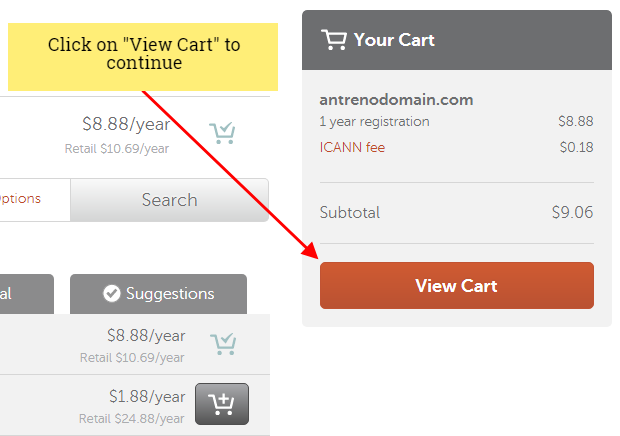 Click the “View Cart” button to continue the domain registration process. On the next page, you can select the registration period for which you pay upfront (you can pay upfront for your domain name for ten years).You can start by paying for one year, and then you can easily extend this period from your back office at any time you want. Just below the registration period, there are two more options. One is called “WhoisGuard” and the other one “PremiumDNS“. NameCheap currently offers a free year of WhoisGuard protection when you register a domain name. This might or might not be still available when you register your domain name. The WhoisGuard service is intended for customer protection and what it basically does, is to hide domain owner’s information from being displayed when someone looks for your domain name with a site like whois.domaintools.com. Let’s take a look at my domain name, antreno.com. 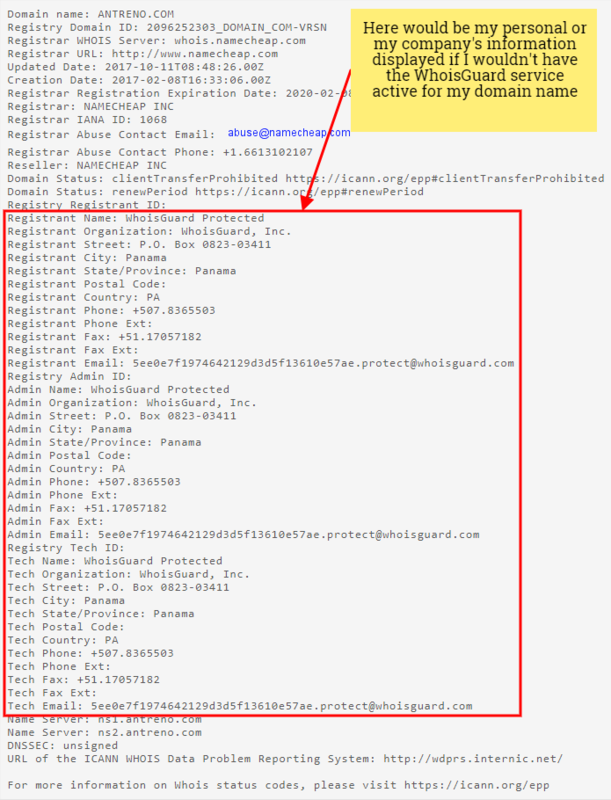 If we look for antreno.com domain name, with whois.domaintools.com, then we’ll see that my personal information are not displayed. Instead of my personal info, because I have the WhoisGuard service active for my domain name, it will be displayed a “WhoisGuard Protected” message and the details of the company behind the “WhoisGuard” service. If I wouldn’t have the WhoisGuard service enabled for antreno.com, there would be displayed my personal or my company’s information instead of the ones displayed by WhoisGuard. By hiding that information, WhoisGuard will prevent scrapers from stealing your personal information and will save you from a lot of unwanted spam emails and will prevent automated scrapers from stealing your phone number or company details. Since NameCheap has provided this service for free since I’ve become one of their customers, I always leave this option enabled when I register a new domain. You can disable the WhoisGuard renewal for your domain name at any time from your back office. Even after the first year, WhoisGuard it’s a very cheap and useful service, and I keep renewing it. The second option is PremiumDNS. I’ve never used a Premium DNS, so I always leave this option disabled. Even though this feature has some advantages, there’s no need for it when you first start your website or blog. Below on the page, NameCheap also recommends a few other services that you might need. The first recommendation is a web hosting package. While I love NameCheap for registering domain names, I’ve never purchased a web hosting plan from them (even if they have very cheap web hosting plans), so I cannot say if their web hosting is good or bad. I usually like to purchase web hosting separately from companies with their primary focus on offering web hosting services, while NameCheap’s primary focus I think is the domain name registration. The second recommended service in this list is “Build and promote your website“. I have no idea what these tools are of if you have to pay additional money for these, but I have always ignored this option. The third recommended service in that list is “Secure your site with PositiveSSL for just $1.99 for the first year“. I recently started to add this service as well to my cart when I buy a new domain because it’s cheap and I would buy an SSL certificate anyway. A PostitiveSSL certificate is a certificate issued by a Comodo and has the overall role to make your site safer. The SSL certificate is used to secure credit card transactions, data transfer, user login info, etc. To take effect, an SSL certificate will have to be installed on your web hosting server and your site will become accessible with a secure “https://” protocol (see my domain name: https://antreno.com and the green lock before the URL). To encourage the usage of the SSL certificates, Google has announced since 2014 that an SSL certificate will also have a lightweight SEO benefit. Therefore, besides the data security, an SSL certificate has also become an SEO ranking signal (currently not very strong, but this might change in the years to come). So, I recommend you to also purchase the PositiveSSL certificate from NameCheap once with your domain name. I have never purchased the last two services recommended by NameCheap, so I’ll leave this at your decision if you need those services or not. Both of them are concerning email. 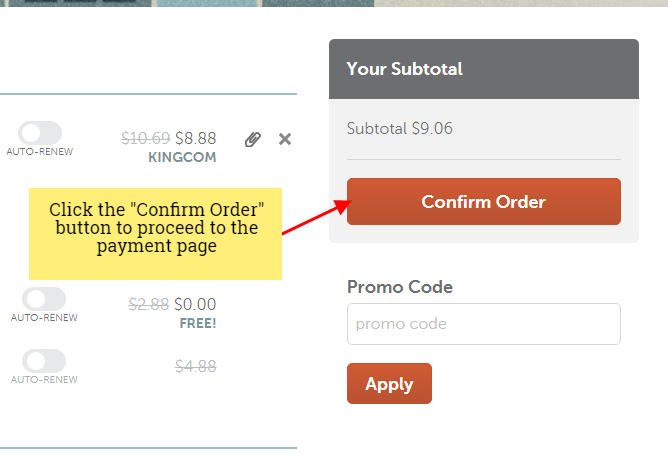 Once you have decided what services you need, click the “Confirm Order” button to advance to the next page. 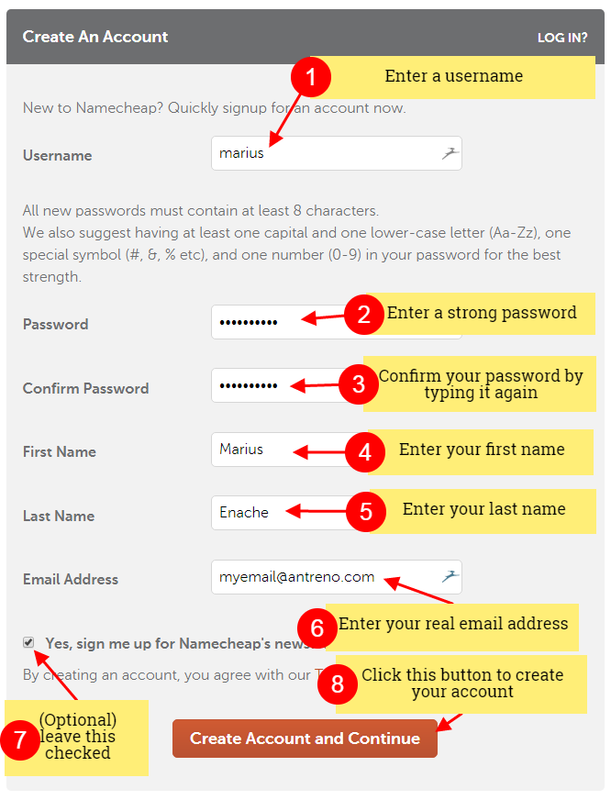 If you are not logged in already, on the following page you will be asked to log in if you already have a NameCheap account, or to create an account if you are a new customer to NameCheap. There’s no need to create a new account if you already have one, so just log in. If you don’t have an account, create a new account by filling up the account registration fields. After you create your account, you might be asked to confirm your email address by clicking an activation link received via email. On the next page, you will be asked what payment method you want to use. You can choose between paying with your credit card, PayPal, or with your account funds (if you already have money in your account). Review the billing information displayed below on that page and the renewal settings. 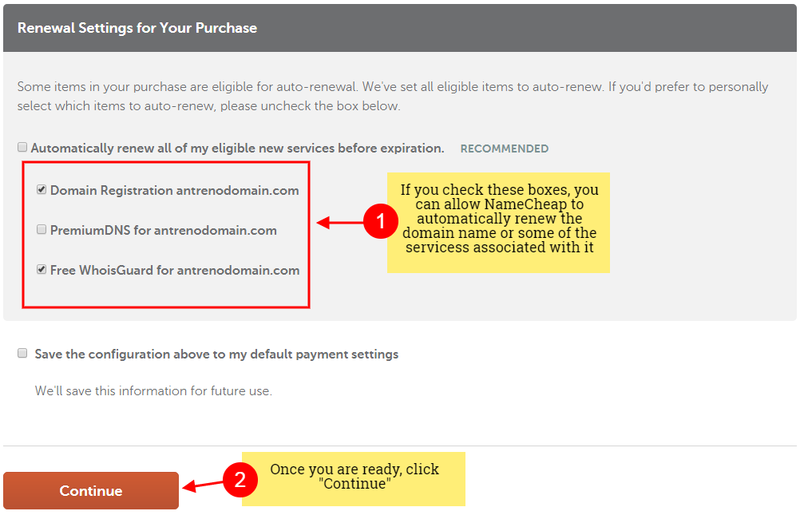 If you want, you can allow NameCheap to automatically renew your domain name or some of the services associated with it. When you are ready, click the “Continue” button. Review the detail of your order and the payment information. 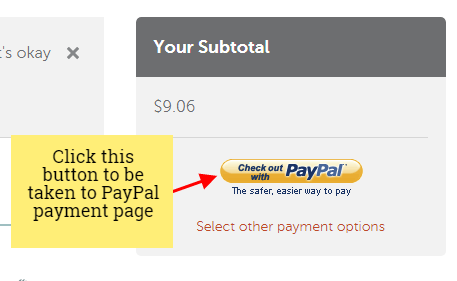 If everything is ok, click “Continue”, “Pay with credit card”, or the “Check out with PayPal” button if you’ve chosen to pay with PayPal. Pay for the domain name with the chosen payment method and in a few minutes, your domain name will be listed in your NameCheap account, under the “Domain List” menu. You can then manage your domain name options from the NameCheap customer area (change nameservers, configure the SSL certificate, redirect your domain, etc). Congratulations! You have now registered your domain name and you only are at a one-step distance from having your website live. 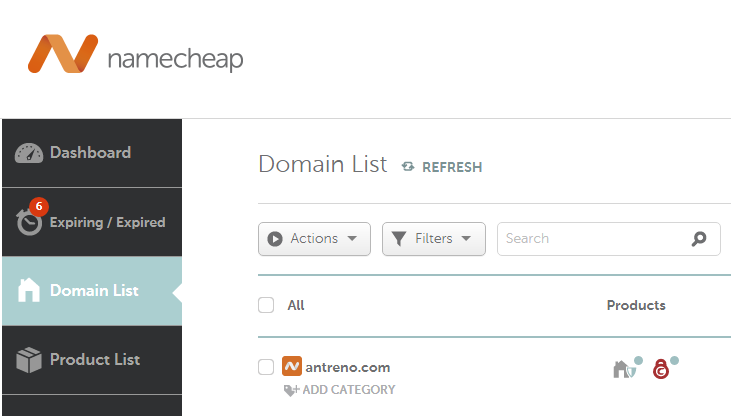 If you access your domain name now, you will only see a default page from NameCheap. Now that you know how to register a domain name, in the next tutorial, I will teach you how to choose a web hosting plan and how to connect your newly registered domain name to the web hosting server.